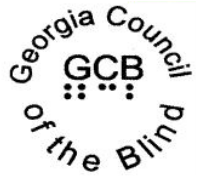 GCB strives to "elevate the social, economic, and cultural levels of the blind." To do this, the organization aims to provide peer support and "educate the public about the problems of blindness and the needs and capabilities of the blind." CVI is "Georgia’s largest comprehensive, fully accredited private facility providing rehabilitation services for the blind and visually impaired."